Want to make a homemade gift for a man in your life? 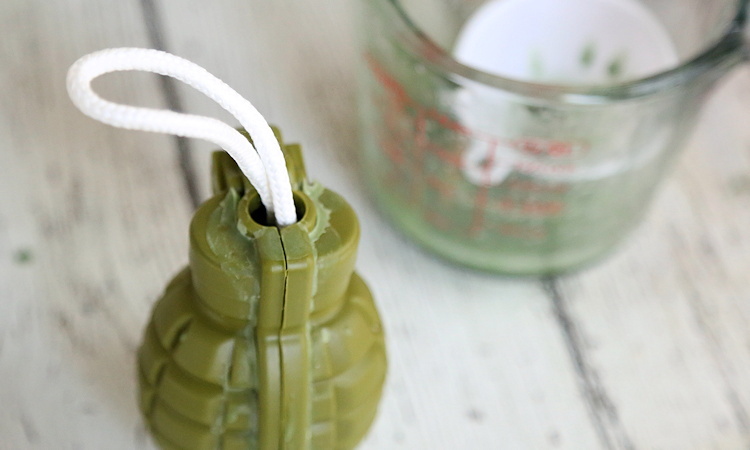 How about this fun DIY Grenade Soap on a Rope. 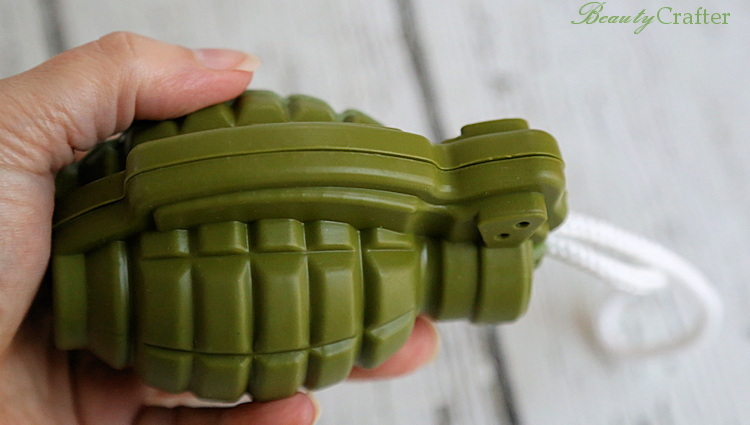 It’s great for anyone with a military affiliation, kids who love army stuff or just plain anyone that would get a kick out of this quirky homemade grenade. Soap on a Rope… why? The concept of a soap on a rope was actually developed in 1949, but hit a sort of fad status in the 1970s. Yes, I actually remember the 70s. While it was seen as a way to avoid dropping your soap in the shower by looping the rope around your wrist, the biggest benefit of a soap on a rope is that hanging up the soap when done showering allows it to dry quickly. A soap on a rope need never sit in a puddle, getting gooey and nasty on the bottom. The ropes I used are actually a bit shorter than the standard soap on a rope. I wasn’t really concerned about them getting dropped. I just wanted them to hang to dry. Simply use a longer length of rope if you want to to wrap on wrist or be able to be worn around neck. This is an easy soap project that uses melt and pour soap , a grenade ice mold, pigment, fragrance and clothesline for rope. Excluding cooling time, this project shouldn’t take more than about 10 minutes to make. Full recipe measures and directions below. 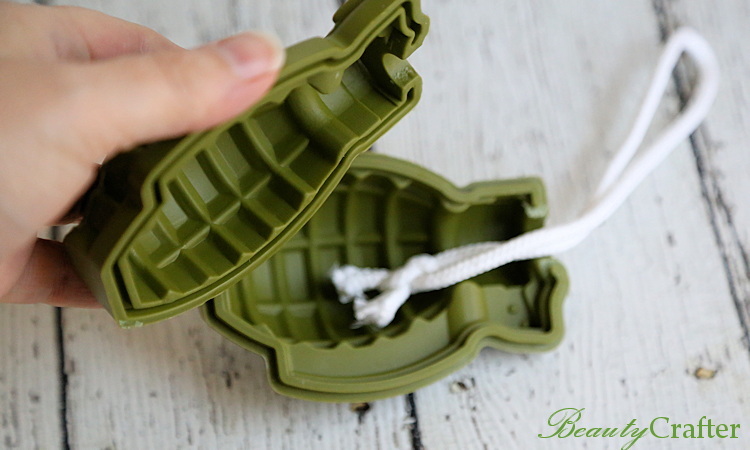 The grenade soap mold is actually a large ice mold, but it makes a good size soap (nearly 7 ounces). I simply used some fresh clothesline for the rope. It fit nicely in the opening of the mold, while leaving room to pour soap in. Make sure all the edges of the soap mold are firmly sealed together. Weigh and melt the soap, then stir in the green soap pigment . It only takes 1/8 of a teaspoon of pigment to color the soap. When you first stir it in it will seem like there isn’t enough. Be patient, gently stir, and you will see the color start to deepen like magic! Once the rich color has developed the soap should be cool enough to stir in some fragrance. Insert a small funnel in opening of mold beside the rope and carefully pour in the melted soap. Once the mold is filled, adjust the rope to the center and allow to fully cool before unmolding. 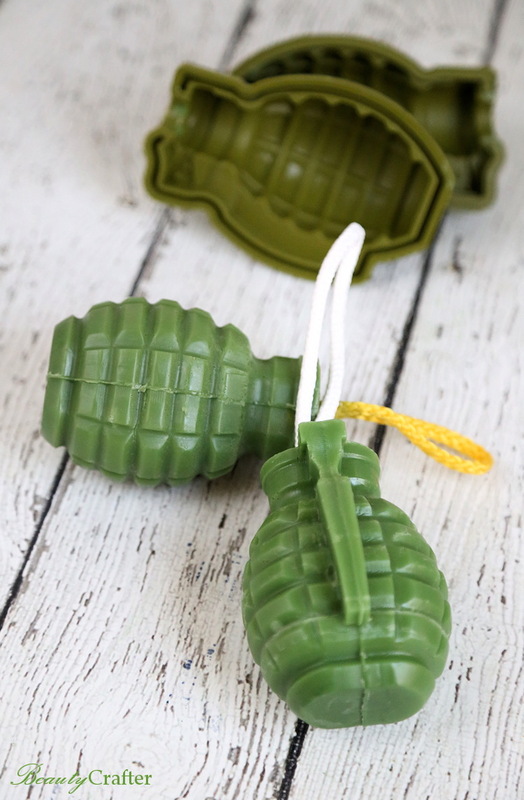 This grenade soap on a rope is a great gift for men or anyone in the military or interested in it. Cut the length of rope/clothesline that you want to use. Knot the end and place in mold. Seal the mold up well. Cut and weigh the clear melt and pour soap base. Place in a glass measuring cup. Melt the soap base in microwave. Start with 30 seconds and add 10-20 second intervals until soap is fully melted. Add the green soap pigment. 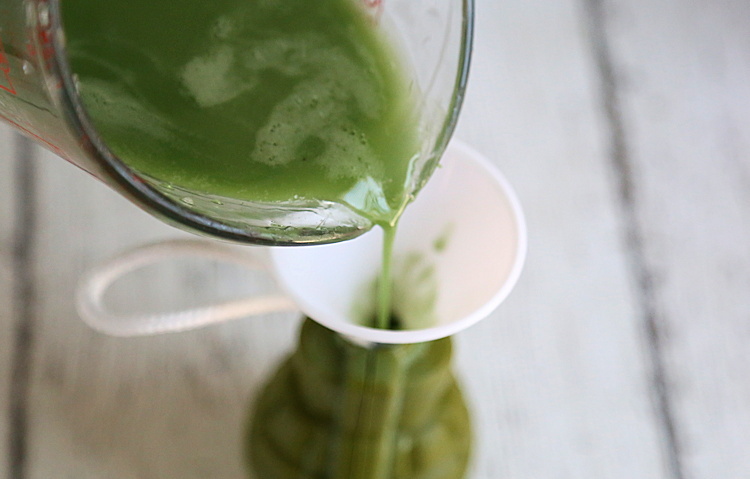 Stir gently until the color becomes a rich green. Avoid the temptation to add more pigment early on. The color will develop. Add the fragrance/essential oil you have selected and stir in. Place a small funnel in opening of mold to the side of the rope. Carefully pour in your prepared melted soap. gently tap the mold against surface to release air bubbles and top off with soap. Center the rope and allow the soap to fully cool before removing the silicone mold. 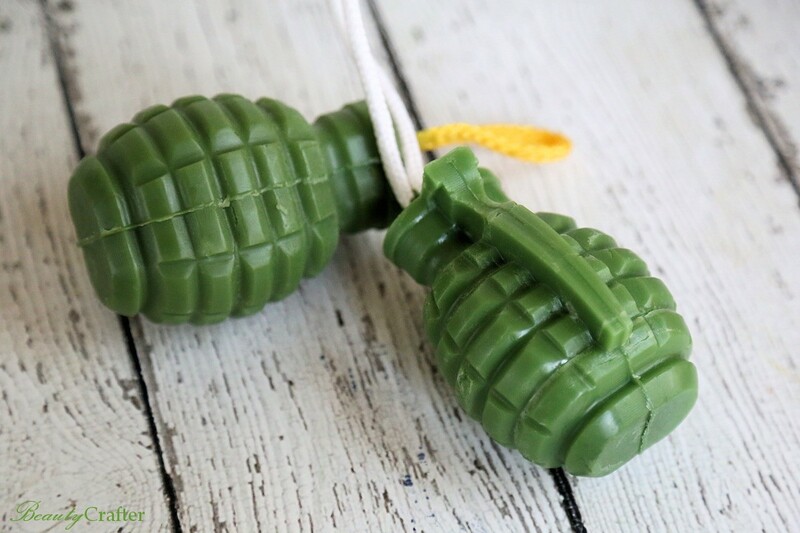 Trim any bubbles off the flat top of the grenade soap with a knife. I prefer to clean up the sides with my hands to avoid scuffing.